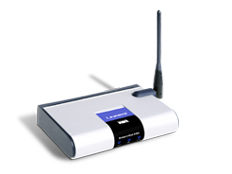 Today we’re going to take a look at an interesting little device, the Linksys WMB54G wireless music bridge. The Linksys support page doesn’t have any firmware updates available, so let’s take a peek at the hardware. Working with embedded devices, I end up using TFTP quite a bit. While most operating systems offer TFTP clients, they tend to be a bit archaic and lack simple features that we hacker types might find useful. So of course, I rolled my own. Although these are simple, seemingly innocuous features, they are severely lacking in most TFTP client utilities, and as we’ll soon see, they can be key features when analyzing/exploiting embedded systems. You can grab tfcp from the Google Code page; you’ll need to install tftpy first, either from source, or through apt-get (python-tftpy).